The Mayo Clinic Multiple Myeloma (MM) Specialized Program of Research Excellence (SPORE) aims to improve treatment of patients with MM and to understand the mechanisms of disease initiation, progression and relapse. The cores provide support for the main research projects, developmental research projects, and career enhancement investigators to facilitate MM translational research. SPORE investigators work together as a team to meet the goals of the program and also interact with investigators from MM SPOREs at other institutions to improve outcomes for patients. The renowned journalist and Mayo Clinic Trustee Tom Brokaw will serve as a patient advocate to the SPORE to represent the interests of patients with MM and increase awareness of and support for MM research. Advances with new agents have been incremental. Even combination regimens with active agents such as bortezomib and lenalidomide have median progression free survival (PFS) rates of only 20-30 months in the newly diagnosed setting, and 6-15 months in the relapsed refractory setting. Greatly touted new agents such as pomalidomide have a median PFS of only 3-6 months in patients who fail bortezomib and lenalidomide. Thus, new approaches to target MM are desperately needed. 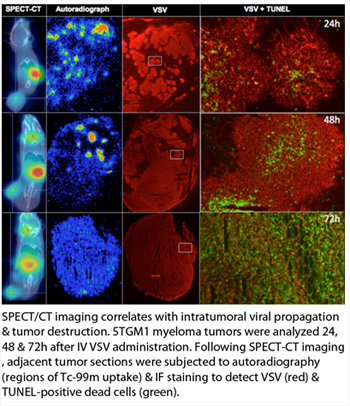 Virotherapy is a new cancer treatment modality that targets the transformed phenotype rather than specific molecular defects in the transformed cell. By matching the unique features of an advanced malignancy (multiple myeloma) with the specific characteristics of a newly created oncolytic virus (VSV-IFNΒ-NIS), we believe we have identified an ideal (and highly innovative) clinical scenario that will allow us to conclusively demonstrate the therapeutic potential of this still unproven experimental treatment modality. Patients with advanced myeloma will likely have no pre-existing immunity to VSV, they have a sluggish immune response to viral challenge, and their tumors are highly vascularized favoring virus delivery via the circulation. Moreover, myeloma cells are highly permissive to VSV infection that spreads with very fast kinetics, and is selective for the myeloma cells. VSV can stably accommodate multiple additional genes and has been equipped with IFNΒ to enhance its safety, myeloma specificity and anti-myeloma potency, and NIS to allow noninvasive monitoring of its in vivo spread. In addition, the anti-myeloma potency of this recombinant VSV in preclinical testing was truly remarkable both in comparison to other oncolytic viruses and in comparison to other VSVs against other experimental malignancies, studied in many laboratories over a period of many years. A single intravenous dose of VSV- IFNΒ-NIS was sufficient to cure advanced disease in immunocompetent mice bearing large syngeneic MM tumors, without toxicity. Thus, Project 1 offers an innovative bench-to-bedside strategy of high significance because it could potentially offer a dramatic new treatment option for MM. What is the safety profile, toxicity, and maximally tolerated dose of VSV-hIFNΒ-NIS? What are the dynamics of virus spread using non-invasive imaging, viral persistence and antiviral immune response? What are the factors associated with response to VSV-hIFNΒ-NIS therapy? The IMiD class of immunomodulatory drugs is a backbone of the conventional therapy of MM. Project 2 identifies an entirely new and unrelated class of immunomodulator with marked pre-clinical activity in MM. Inhibitor of Apoptosis Proteins (IAP) antagonists have been studied in cancer because of their ability to induce caspase 9 release from XIAP, resulting in apoptosis. Our group previously identified homozygous deletion of cIAP1 and cIAP2 in MM as a mutation that activates the alternative NFkB pathway, the first clue as to the role of IAPs in the NFkB pathway. 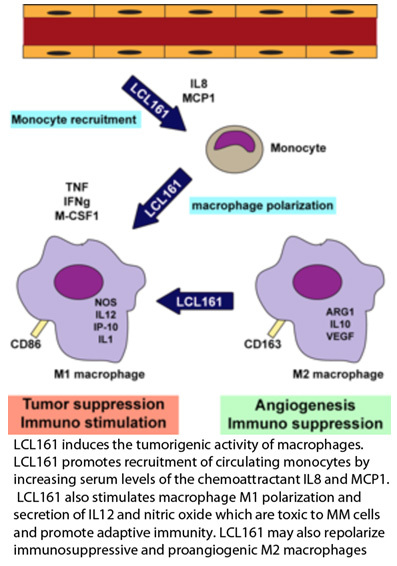 The IAP antagonist LCL161 has more then tenfold greater affinity for cIAP1/2 then XIAP. As expected this drug has no direct anti-MM activity in vitro against MM cell lines or primary MM samples. However it has marked activity in our novel, highly predictive immunocompetent mouse model of MM. The in vivo activity is due to activation of the alternative NFkB pathway in tumor infiltrating innate immune cells (likely macrophages), which together with signaling from IFN leads to activation of a cytotoxic program. 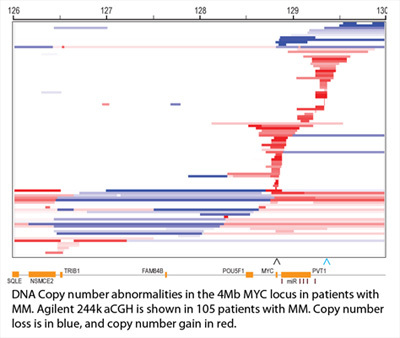 The identification of MYC translocations in BALB/c plasmacytomas over thirty years ago led to an intense study of MYC in human MM. It is remarkable that only now, using high-density genomic techniques and next- generation sequencing approaches, we find that a genetic rearrangement of the MYC locus is the most common mutation in human MM, present in 43% of untreated patients overall, and 70% of patients with hyperdiploid MM. An unbiased GEP analysis identifies MYC and it’s target genes as the major difference between MGUS and MM, and the introduction of a MYC transgene into a mouse strain that spontaneously develops MGUS, results in one that uniformly develops MM. These findings indicate that MYC dysregulation can cause the progression of MGUS to MM in mice. Project 3 aims to determine if this also happens in man, and whether a rearrangement of MYC is a genetic feature that can distinguish a benign MGUS from a malignant MM. This is critically important because the goal of therapy should be the elimination of all malignant cells, not necessarily the clonally related, but benign MGUS cells. Furthermore the clinical significance of MYC rearrangements is unknown. IMiDs have been reported to lead to a cereblon-dependent down-regulation of MYC, and they appear to be most active in hyperdiploid MM (~70% MYC rearrangements), but to have almost no activity in t(11;14) MM (~15% MYC rearrangements). These observations suggest that it is critically important that we determine whether rearrangements of MYC are a biomarker of IMiD response. 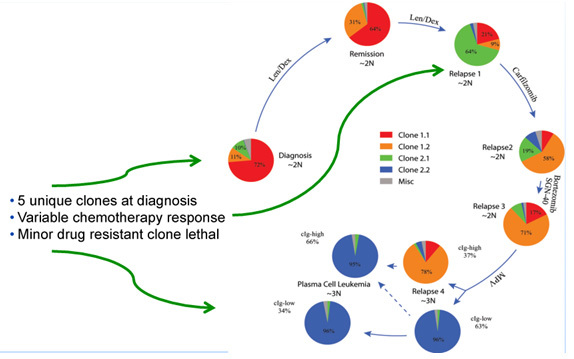 Do rearrangements of the MYC locus distinguish benign from malignant clonal plasma cells? Does outcome correlate better with eradication of cells with the MYC rearrangement then with the clonal IgH rearrangement? Do IMiDs preferentially target cells with MYC rearrangements? A major breakthrough has been the recognition of the high degree of clonal heterogeneity in MM, and its modulation by therapy. The heterogeneity can be appreciated using very deep (x1000) sequencing of a panel of 77 genes recurrently mutated in MM. In Project 4 we propose to study a large number of patients (726) at diagnosis with this gene panel to determine the clinical significance of mutations of genes in this panel, and of tumor heterogeneity, comparing in some cases the results in matched relapsed samples. Finally most of the sequencing that has been done in MM has been in samples from earlier stage patients, very little is known about the spectrum of mutations in late stage refractory patients, the ones in most need of better therapies. To address this will perform whole exome and RNA sequencing in 60 late-stage patients. What is the clinical significance of the recurrent point mutations in MM? What is the clinical significance of baseline tumor heterogeneity measured by the 77 gene panel? What is the effect on clonal selection of a two-drug vs three drug combination? How does the addition of an IMiD to a PI affect clonal selection? What are the mutations associated with IMiD and PI resistance in late stage MM patients? The Mayo Clinic has an impressive track record of identifying and fostering the research careers of numerous leaders in the field of multiple myeloma (MM). Over 25 faculty members are involved in MM research at Mayo, most of whom are nationally recognized leaders in the field and received training at Mayo prior to joining the faculty. In addition, there are other leaders in the MM field nationally and internationally at various institutions who trained at the Mayo Clinic. Thus, the CEP designed as part of the Mayo Clinic MM SPORE application possesses the credibility and experience needed to succeed in the stated goals. The CEP is designed to identify new investigators who can make a difference in the outcome of MM through strong and meaningful translational research and to increase the translational investigator base in the MM research community and the Mayo Clinic MM SPORE. The Program will identify and foster the research careers of selected investigators who have an interest in MM translational research. This program will provide much needed support for promising young laboratory or clinical investigators early in their career so that they can focus their energies on research projects related to MM. Generate new hypotheses that can be tested and provide the foundation for future large-scale research projects or clinical trials in order to reduce myeloma incidence and mortality rates. The Biospecimen Core will support all four SPORE Projects and will be responsible for sample collection, processing tracking and allocation. This functionality includes data collection, database development/maintenance, and data quality control. This Core also provides a mechanism of consistent and compatible data handling, thereby facilitating management of collected data and integration with data from existing Mayo resources. The biospecimens aspect will be unique in that it will be built upon existing tissue banking facilities at the Mayo Clinic Rochester and Arizona. The resources requested for the support of this Core will provide ongoing funding for and augment the capabilities, personnel, equipment, and expertise at both institutions, guaranteeing successful performance. The Biospecimen Core of the SPORE will allow not only for augmenting our ability to collect, store and track pertinent MM specimens, but also for us to expand our services to a higher level. This Core will provide the SPORE projects with services that include integration of gene expression profiling, next-generation sequencing, FISH and flow cytometry further enriching the data associated with each patient. Biobanking for MM and related disorders began in 1961 and has been the basis of several seminal contributions to the natural history of MGUS, asymptomatic or SMM, MM, and related disorders. The current Biobank contains more than 172,400 samples from over 44,600 patients, which are available to share with internal research projects and share with external investigators. The core will generate and complete data-mining projects using existing clinical data, including exploration of flow-cytometry, FISH, and GEP. By amassing so much clinical data in one system, ideas for data-mining projects abound. The focus during the next 5-year period will include exploring the roles 6-color peripheral blood flow cytometry and 8- color bone marrow flow cytometry play in patients with multiple myeloma. The Biostatistics and Bioinformatics Core is responsible for all core related analytical activities for each of the SPORE projects. The SPORE projects span a wide range of analytical areas that include clinical trial-focused studies and associated lab-based correlative studies and Next-Generation Sequencing (NGS) genomics studies. As such, the core scientists will provide oversight of all SPORE-related statistical and bioinformatics activities, and they will coordinate and combine efforts on each project as a function of needs. The core will support investigators with the management of the phase I clinical trial, determining the optimal design, defining data that should be collected as well as creating and implementing an appropriate analysis plan. The core will oversee the collection and management of the clinical information required by each study. The core will also assist SPORE investigators with the analysis and interpretation of genomics and proteomics data while helping to leverage internal and external sources of biological information to promote cancer discoveries that will have an impact on patient care. Bioinformatics will leverage the large set of genomics analytical capabilities developed by the Institutional Bioinformatics Program for the preprocessing of NGS RNA-seq and DNA-seq data. Members of the core have already provided extensive collaboration on the design and analytical components for each of the SPORE projects and will continue to do so throughout the entire funding period. Centralized data collection and management will ensure non-redundancy of data elements, standard data definitions, the integration of clinical and laboratory data, and the consistent use of patient data across all projects. Central data analysis will ensure consistency of analytic and statistical techniques and interpretations among all SPORE research. 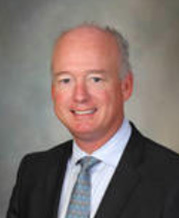 Dr. Bergsagel is a Professor of Medicine in the Mayo Clinic College of Medicine, and co-Director of the Hematologic Malignancies Program in Mayo Clinic Comprehensive Cancer Center. He has made major discoveries in the genetics of MM, including the identification of recurrent immunoglobulin gene translocations in MM, promiscuous mutations of the NFKB pathway, and clonal heterogeneity. These have had important implications for the management of patients with MM and identification of t(4;14), t(14;16), t(14;20, and t(11;14) chromosome translocations in MM tumor samples is now a part of standard clinical practice. He has also developed the highly faithful Vk*MYC genetically engineered mouse model of MM that is very useful for preclinical drug development. Dr. Bergsagel completed medical school at the Univeristy of Toronto, residency in Internal Medicine at the University of Toronto and Stanford University, and fellowship in medical oncology at the National Cancer Institute. He has contributed numerous articles and abstracts to the scientific literature and received numerous awards and distinctions, including the Robert A. Kyle Mayo Clinic Distinguished Investigator Award and The Daniel E. Bergsagel Visiting Professorship, He is a member of many professional societies including the American Society of Hematology, American Association of Cancer Research, American Society of Clinical Oncology, American Society for Clinical Investigation, American Association of Physicians. 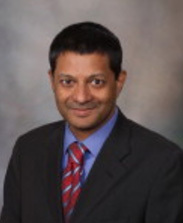 Dr. Rajkumar is a Professor of Medicine in the Mayo Clinic College of Medicine, chair of the Myeloma Amyloidosis Dysproteinemia Group at the Mayo Clinic, chair of the Eastern Cooperative Oncology Group Myeloma Committee and co-chair of the International Myeloma Working Group. He has led numerous clinical trials, including the registration trial that led to the approval of thalidomide in MM. Epidemiologic studies he has lead have determined that all patients with MM have preceding MGUS, established the natural history of smoldering MM, and provided the first description of familial MGUS. His laboratory studies were among the first to establish the importance of angiogenesis in myeloma. His current research is focused on the progression of MGUS to MM, novel therapy for MM, and laboratory studies on the incidence and risk of progression of monoclonal gammopathies. He has a long-standing interest and expertise in studying racial disparities in the incidence of myeloma, developing biomarkers for predicting disease progression and response, and in studying familial and genetic associations of myeloma. Dr. Rajkumar earned his medical degree at Christian Medical College, Vellore, India, completed residency in internal medicine at the University of North Dakota, and fellowship in hematology and oncology at the Mayo Clinic College of Medicine in Rochester, MN. He has made enormous contribution to the field of MM, authoring more then 500 manuscripts. He is on the Board of Directors of the International Myeloma Foundation, section editor for Leukemia, and associate editor for Mayo Clinic Proceedings.